One myth about mitts is that they are used to develop power. This is really not the case as they are too thin for that type of workout. This does not mean that you cannot hit the focus mitts hard - you can - but endurance and power workouts are best served on Thai pads or a heavy bag. With mitts, you are able to work distancing and timing. Boxing punches and elbows in MMA are limited by their range. If you are too close for certain punches, they will become jammed. If you are too far, they will not reach their mark. As such, working with a trainer holding the mitts allows for effective training in this manner. The trainer is able to move around which requires the partner to adjust distance and timing in order to land an accurate hit. This, in turn, develops skills which open the door for more effective sparring since effective skills are required. And a more advanced avenue of this type of training is the ability to develop angles of attack. You cannot be an effective striker if you travel on a straight line as this will lead to a knockout more than anything. Such movement is too predictable and it leads to being easily pinpointed and targeted for counterattacks. By moving around while training with the mitts, the ability to develop movement based on angles can be enhances. This lays the foundation for being a much harder target to hit. This ties into the next vital component which is the ability to develop evasive movements and footwork. Again, using focus mitts is not all about striking. Movement is critical to working with mitts since the trainer does not approach the workout from a static stance. The key to focus mitt training is to present a moving target that mimics an opponent as the opponent would move in the ring. MMA matches are hardly static and that is why such movement is necessary. If not then the ability to get the most out of the striking training session will be undermined. And, of course, the mitts provide a surface for the fighter to hit. By having the ability to hit a target, all of the distancing and timing components to mitt training are tied together with the striking. This aids in developing the needed skills to be successful. 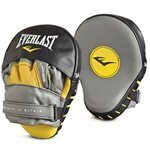 Just be sure to complement your training with mitts made by legitimate boxing/kickboxing companies such as Twins, Everlast, Revgear, Ringside, etc. 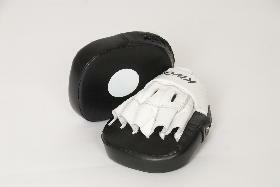 The mitts made by reliable companies will ensure a safe and effective training session. 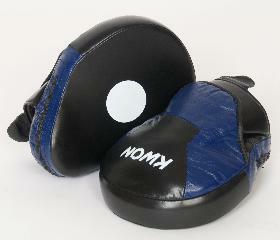 They are manufactured with full contact training in mind with a curved design. This provides a natural alignment that protects your wrist and shoulders. 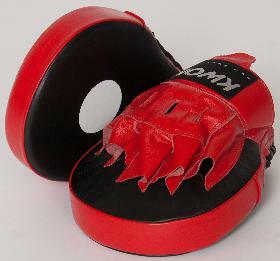 The Champion Focus Mitts are made by Kwon and are constructed of genuine leather which means they will last a long time and hold up to all you can dish out. These Focus Mitts feature a new finger cover to protect your fingers. These mitts are similiar to the above, but they are open fingered. These mitts are lighter than the other two and are for speed training. They are made of pvc. The are only slightly curved, where the other two are contoured more too your hand. They are sold in pairs and come in blue with black. As with all Kwon products, you can be assured you are getting a quality product at a great price. KWON is not a well known brand in MMA, but they really are quality. For a cheaper brand you can go wtih Tigerclaw but the quality is not as good.